Many say that Muhammad Ali was the greatest boxer of all time. It was beyond dispute that during the 1970’s he was the most recognizable sports figure in the world. His flamboyant style contributed greatly to the infusion of entertainment into the realm of serious sports. 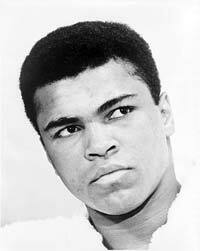 Muhammad Ali was born Cassius Clay on January 17, 1942, in Louisville, Kentucky. When he was 12, a thief stole his bike and an angry Clay said he wanted to beat up the thief. A police officer commented that Clay should learn to box first. He took the advice. The police officer, Joe E. Martin, became the youngster’s first boxing coach. In time, Clay would become a very successful amateur and end up being trained by Chuck Bodak. Clay’s amateur fighting career was stunning. He was a two time Kentucky Golden Gloves champ. He went on to have a 100-5 amateur fighting record and go on to compete in the Rome Olympics where he would win the Gold Medal as a light heavyweight boxer. On October 29th, 1960, Clay would turn pro and win his first match via decision. By 1963, he would rack up 19 wins and no losses. He scored 15 knockouts. He was in line for a fight against heavyweight champion of the world Sonny Liston whom the flamboyant Clay would mock in humorous interviews. Clay would score a major upset and beat Liston for the title. The post match turned into a circus shocking traditionalists. The end result was the 22 year old Clay was a major star. Clay converted to Islam and changed his name to Muhammad Ali. He would have a very controversial win in a rematch against Liston. Rumors have long since circulated Liston took a dive, but no one was ever conclusively proved this to be true. Ali would go on to successfully defend his title numerous times. He would set an attendance record fighting Cleveland Williams in a bout in Houston that had over 35,000 in the crowd. Ali refused to enter in the armed forces as he was a critic of the Vietnam War. His boxing license was revoked as a result. From March, 1967 to October, 1970, he could not fight until the Supreme Court ruled he could have his license back. This would lead to one of the most famous comebacks in modern boxing history. Ali’s most famous opponents of the early 1970’s were Joe Frazier and George Foreman. Ali would suffer his first loss to Frazier in 1970 and then go on to have several successful bouts until beating champion Foreman in the Rumble in the Jungle. He would go on to face Frazier two more times with the most famous of these fights being the Thrilla in Manila which Ali won. Ali would end up declining in the ring as the 1970’s rolled in. He had a ludicrously awful boxer vs. wrestler bout in Japan against Antonio Inoki. The rules led to 15 rounds of non-action and was an embarrassment. Ali did receive millions of dollars for the fight. Ali would maintain his fame, but his matches got worse and worse. Fights against Leon Sphinx and Larry Holmes were an embarrassment. A 1981 bout against Trever Berbick was also less than stellar. Ali lives in retirement and still remains a legendary figure. Sadly, he battles Parkinson’s disease, a condition many blame on his boxing career.